Chronic obstructive pulmonary disease (COPD) is a progressive disease that makes breathing difficult. Chronic bronchitis and emphysema are two disorders that fall under this category. 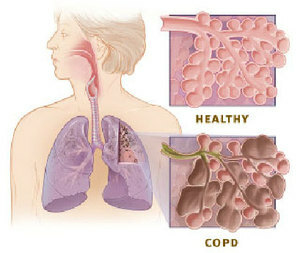 A diagnosis of COPD indicates that damage has occurred to the delicate tissues of the lung: the alveoli or air sacs. The once numerous small, elastic-walled sacs have coalesced into larger floppier-walled areas, like a deflated balloon. A diminished surface area remains for the function of gas exchange. Even mild exertion can bring on breathlessness or a coughing fit and exacerbate the condition. Reliever medications are often prescribed for COPD and while they may offer temporary relief, actually can exacerbate the condition in the long term. Key to the success of the Buteyko Breathing Clinic programme is in helping our clients reduce the severity of their symptoms through improved breathing efficiency. Nasal breathing is encouraged at all times and the pace of everyday activities is adjusted to accommodate the breathing techniques learned. Symptoms such as breathlessness and coughing can improve in as little as one week. With progress, increased mobility and greater stamina is possible. It is often quite a surprise for a person with COPD / emphysema to discover that improvement is possible after having resigned themselves to slow, irreversible deterioration.